where M is the metal or metal alloy. Traditionally, metal hydrides have been classified into two main categories: intermetallic alloys and complexes. Intermetallic alloys, including AB5, AB2, AB, and A2B materials form hydride compounds resulting from combining a stronger hydride-forming element with a weaker hydride-forming element to attain appropriate thermodynamic characteristics. Complexes, such as sodium alanates, can be covalently bonded, ionic complexes which reversibly form chemical bonds with hydrogen in the presence of a catalyst. Due to the necessity for high-energy-density hydrogen storage solutions, materials comprised of light metal elements are of specific interest - including, but not limited to, lithium (Li), sodium (Na), magnesium (Mg), calcium (Ca), boron (B), nitrogen (N) and aluminum (Al). Hydrogen storage materials synthesized from these elements are typically found in the form of finely divided powders that may be pyrophoric and/or water-reactive. Additionally, the oxidation or hydrolysis reaction products may also present hazards. In the case of alkali-metal-based materials, the oxidation products can include hydroxides, oxides, peroxides, and possibly superoxides. Additionally, those compounds composed of nitrogen or boron, under certain circumstances, may form trace amounts of ammonia diborane gas. Some of these materials may present a health hazard and form hydrates in a humid environment that can decompose rapidly as a result of friction or heat. Laboratory safety signage should include "Use Dry Powder Agent Fire Extinguisher Only, No Water". Work should be completed in an inert gas environment of nitrogen or argon. This includes material preparation (including mechanical milling if possible), material installation, and material removal. Gloves and seals should be inspected on a regular basis to verify integrity. The environment should be kept pure by purging the glove box and the use of an isolatable antechamber. The antechamber should be kept at vacuum while not in use. All items brought into the box should be purged and evacuated at least 3 times to remove the threat of contaminants. If a user has the antechamber in a purged state and then leaves the laboratory, they should not presume it is still in a purged state when returning, since others may have opened the outer door. 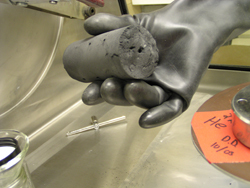 The inert gas pressure within the glove box should be kept slightly above atmosphere (~3mbar) at all times. The source of this gas should be checked for adequate supply on a daily basis. Moisture/oxygen sensors in place and monitored continuously. Oxygen level maintained at <10 ppm. An alarm should be set to notify the user if limits are reached. Experimental vessels should be designed with a safety margin to withstand the pressure of fully dehydrogenated material samples and/or be equipped with appropriate pressure relief devices. During storage, all materials should be sealed in secondary containment within the glove box. Material within sealed experimental vessels should be stored at ~1bar overpressure inert gas when not in use. Experimental vessels should be locally transported in secondary containment to avoid accidental exposure to the environment or rupture. Material to be shipped over public roadways must be properly contained and marked according to DOT regulations. A working database of materials should be maintained and reviewed on a regular basis. Proper care should be taken when using flammable solvents as cleaning fluids to avoid flammable gas cloud mixtures. Use only hydrophobic wipes for cleaning crucibles and hardware within the glove box to minimize water vapor content within the box. Use plastic or ceramic utensils as much as possible during scraping or cleaning of containment vessels to minimize localized heating during use. All experimental containment vessels should be leak-checked with high-pressure helium prior to evacuating in an air environment. Waste materials should be sealed under inert gas and disposed of as hazardous waste material. Materials neutralization procedures should be identified and instituted before materials synthesis begins. Any material that has been exposed to air under any condition should be properly disposed of as hazardous waste immediately. *Note: This section was prepared by an international team of experts led by Sandia National Laboratories (Livermore). To satisfy these foundational principles, the recommendations below should be considered and applied. Develop an understanding of the material at a small scale. 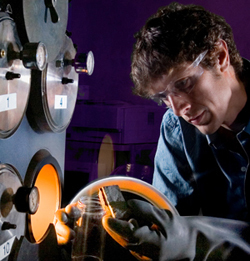 Perform experiments to understand the material and its reaction properties prior to scaled-up experiments. Select appropriate structural materials based on hydrogen compatibility and duty cycle (e.g., 316 stainless steel). During prototype development, avoid operation near design limits and unproven structural materials and technologies. Test prototype containment vessels to failure to validate performance limits. Define a system model with all components and their functions. Predict modes of failure for each component including cause, effect, frequency, and detectability. 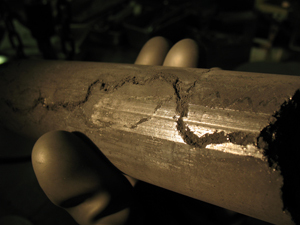 Perform a criticality analysis to identify and mitigate the highest-risk failure modes. Improve system design, controls, and procedures. Provide pressure-relief protection to avoid over-pressurization during excess temperature events. Provide passive pressure-activated inert gas purge to discourage air exposure during loss of pressure. Implement hardware and software safeguards to prevent operator error. Mitigate thermal control runaway by duplicating critical sensors (e.g., thermocouples). Limit access to the laboratory to critical personnel only. Validate critical components such as temperature and flow control prior to operation. Perform unmanned operation during early demonstration phases. Monitor hydrogen refueling gas quality with Residual Gas Analyses (RGA) or similar to avoid contamination of materials. *Note: This section was prepared by Daniel Dedrick and Terry Johnson at Sandia National Laboratories (Livermore).